I'm planning on visiting London and Paris in early June and I'm just so excited! Even though I've been to London numerous times, there's always something new that I do there, and on my next visit, I will have dinner at 34 Restaurant! I tried to go there last time I visited, but it was a bit out of the way for my London BFF to go, and it was a bit out of our budget too. But I'll be more prepared this time for 34. Check out their menu! Over the weekend, my buddy pal Laurie was surprised to learn that Michael is working on Frank because she and her husband love Frank Sidebottom. They never saw him live, but enjoy his work and lived near him when they lived in England. They are also planning on visiting Sidebottom/Chris Sievey's memorial statue in Timperley this summer. So needless to say, they were both floored when they learned that Fassy is portraying Sidebottom in 'Frank', and they said it's pretty awesome that an actor of Michael's caliber is playing him. Here is an image of Chris Sievey, he was a handsome man. So it's not so far fetched that an equally handsome man like Michael has covered up his head for art. 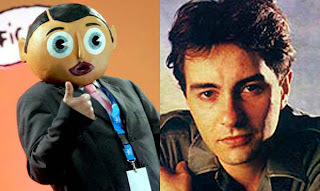 I saw a video of Frank Sidebottom and it was awesome! wow the menu! This restaurant looks like a little paradise! Sievey is unknown in France, it's weird to see that someone can be a legend somewhere and totally unknown in another country! Yes Emilie, the restaurant is very posh indeed. I'll make sure to have some champagne to boot. the rest of my meals while there will be courtesy of Pret a Manger. LOL!